BANGI, 11 Oct 2012 – The National University of Malaysia (UKM) should have its own school or faculty of performing arts as there is a need to cater to youths who want to take up music seriously or as a career. 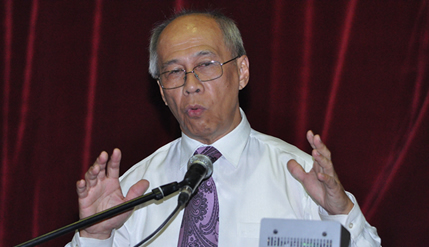 Notable composer and arranger, Dato’ Dr Johari Salleh, one of the country’s most renowned musical virtuosos said a Faculty in ASEAN Traditional Music would go a long way to fill the gaps in the knowledge of regional music. Speaking at a public lecture in UKM onCreativity: Song and Composition, organised by the Cultural Centre earlier this month, he said that Malaysia lacks formal higher education in music and other performing arts, as there is only one public institution that barely caters to such needs. His lecture at UKM was attended mostly by his former students from the days when he was a part-time lecturer at Universiti Teknologi MARA (UiTM). Dato’ Johari, a Principal Fellow at UKM, said even the basics of musical education at school level is not fully addressed. He said it was not enough to have classes in music at primary school level without follow-throughs at secondary and tertiary levels. This gives the impression that music is not important in education. He lamented that pupils formal introduction to music only goes as far as learning to play the recorder and percussion instruments in national primary schools but no further. It is only in the country’s most well-established schools such as The Victoria Institution, St John’s and the Malay College Kuala Kangsar that take music more seriously even if it is as an extra-curricular activity. In those renowned schools, the musical instruments such as the piano, violin and brass instruments are donations or endowments from grateful alumni members, not from the government. He said a well-rounded and balanced education includes instilling an appreciation in the Performing and Fine Arts at an early age giving the example of the developed nations where such education is taken very seriously even for those who don’t intend to be professional musicians. The former RTM Music Director noted that in Europe and America many doctors and scientists are accomplished pianists and musicians in their own right. Dato’ Johari expressed concern that Malaysians would eventually be led into thinking that a career in music would not be seen as respectable and many talented musicians would feel discouraged resorting to playing only pop tunes to eke out a living. If the country is serious to be a centre for performing arts as what the government had often declared, then there must be enough music graduates to fill the positions of prestigious symphony orchestras. He regretted that even after nearly 15 years of existence, very few members of the adequately-funded Petronas Symphony Orchestra are local musicians. Compare this with Singapore, where there are several highly-regarded large classical ensembles with home-grown talent filling the key posts and becoming virtuosos. Born in 1940 in Geylang, Singapore, Dato’ Johari conducted, composed and arranged music for Radio Television Malaysia (RTM) and composed a number of large-scale pieces for the orchestra. His compositions include music for Malay drama, ethnic music and works for orchestra such as Simfonietta Cempakasariand Symphony ASEAN. In his arrangements, he gives a twist of Jazz rythmns to old Malay tunes using traditional instruments in Western orchestras. His compositions have also been performed by the New York Emsemble and Time Orchestra of Kuala Lumpur. He is a graduate of the Berklee College of Music in Boston and recieved an honorary PhD from UKM.